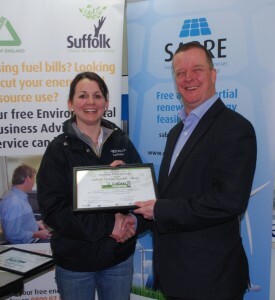 At a ceremony yesterday, Will Pretty was presented with Healeys’ Suffolk Carbon Charter award. “This award demonstrates that our commitment to environmental best practice is being recognised at the highest levels in local government. Our carbon neutral press has just been installed, we have ISO14001 and FSC, we are Carbon Balanced and this year we are aiming to achieve EMAS certification. Buyers can be assured that when they engage Healeys they will be working with one of the very greenest of printing companies in the UK” said Kelly Harris, sales and marketing director. For more information about Healeys environmental printing please contact us.